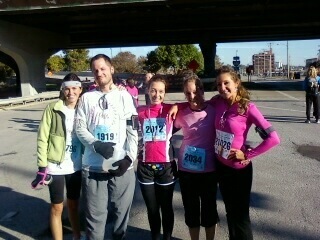 Today, I had the opportunity to “run” a race and not “race” a run. 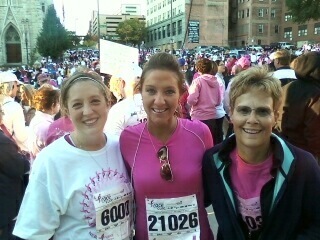 The Race for the Cure is undoubtedly one of the most inspiring events for a woman to get to experience. So many running events are in support of causes and certainly I pay attention to them and care about their impact, but all too often I get so focused on the running that I forget about the meaning and the people behind the event and their stories. Today, I was very lucky to get to run with two very special people: my sister, who I have never run an event with before, and her mother-in-law who is a life-long runner and a breast cancer survivor. The day’s conditions couldn’t have been better and the run itself was fantastic! 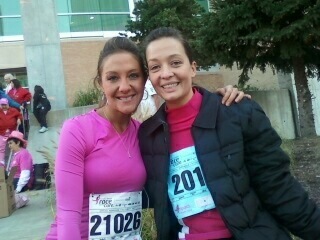 I ran into old friends, work friends, and running with family was very special. 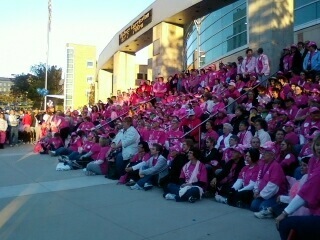 Before the event started, they lined up the survivors on the stairs to take a group picture. I was so shocked to see so many young women’s faces in the crowd and to be in their company was something I’ll never forget. That is what true strength is about and it was something you couldn’t deny when you saw their smling faces. The pastor who said a prayer was fantastic! He said, “Can I get an ‘Amen’?” and the crowd came back with an “AMEN!” Then he said, “Can I get a what, what? ?” And the crowd went wild! My friend Becki was the team captain for my work and she did an amazing job of getting people involved and keeping us inspired leading up to the event! ﻿The event today was not at a racing pace. In fact, I didn’t wear my Garmin or get a chip so I won’t know my official finish. Today wasn’t about capturing a time, it was about being with friends and family, recognizing the impact of breast cancer on so many, remembering women we’ve lost and most importantly, celebrating the women who have beaten breast cancer. I came away inspired and hopeful. It doesn’t get much better than that.